German luxury watchmaker Glashutte Original manufactures perfectly engineered, luxury watches that excel in both precision and high quality. With over 165 years of watch-making history, Glashutte Original introduces its next line of luxury watches just in time for the holidays. Transforming the new luxurious ladies’ watches are stunning diamonds, filigreed hands on noble mother of pearl dials and a range of bracelets in festive red, radiant white or warm gold. Two highlights of Haute Horlogerie bring festive glamour to the men’s collection as well. With their flying tourbillons, the stylish Senator Tourbillon and PanoLunarTourbillon watch models offer an exceptional invention in watchmaking. By representing the “Art and Technik” collection, the new men’s watches from Glashutte Original combine magic and unique beauty with extraordinary craftsmanship and technical sophistication. Inspired by the symbolic use of the moon to represent women, Glashütte Original created the PanoMatic Luna (pictured), an elegant and feminine timepiece whose beauty blossoms in the iridescent colours of its mother-of-pearl dial. Available in two versions, the off-centre hour/minute and subsidiary seconds dials are set against a shining white mother-of-pearl or mystic black dial of Tahitian mother of pearl. A bezel set with 64 clear white diamonds frames the dial, while rod-shaped diamonds serve as indexes to measure the passing hours. The elegant moon phase display presents a shining silver moon and stars against a fine-grained silver sky. A silver frame distinguishes the characteristic panorama date, and a 3.0mm diamond on the crown provides a perfect final touch. The Lady Serenade line from Glashutte Original presents a convincingly feminine and graceful appearance and represents a new generation of classic watches for women. Lady Serenade watches are offered in two different materials: stainless steel and rose gold. Three different versions of each are available, captivating with their fantastically beautiful mother of pearl dials, their diamonds and the glowing colors of their bracelets. The version with a luminous red bracelet made of Louisiana alligator leather captivates with its elegant white mother of pearl dial, rose gold hands and numerals and soft arches in rose gold set with diamonds. The new models in the Pavonina collection from German watchmaker Glashütte Original exhibit a wonderful diversity. Ranging from the simply modern through classic elegance to ornamental opulence, these feminine timepieces exhibit flowing forms and a fascinating array of well thought out details. A wonderful, elaborately decorated watch is the absolute highlight of the Pavonina collection: an array of 98 diamonds, 0.38 carats in all, is presented as a stylized peacock tail; the diamonds are carefully set by hand on the precisely milled, mocca- or mother of pearl-coloured Colorit dial. Along the softly flowing flanks of the case are a further 114 radiant diamonds in the form of a open circle, while the ornate crown is topped with a 0.03 ct diamond. An elegantly shimmering Roma satin bracelet in violet completes this glamorous model. The Pano line is characterized by its noticeably asymmetric dial visuals, which are retained in the new, masculine design of the PanoLunarTourbillon. The hour/minute area and that reserved for the flying tourbillon lie on a vertical axis within the left half of the dial, with the flying tourbillon positioned at 7 o’clock. The panorama date display to the lower right presents black numerals on an ivory colored ground, perfectly matched with the dial. A case in red gold sets warm, noble accents. To the upper right is a superb moon phase display with brilliant golden stars and a golden moon set against a dark blue night sky. 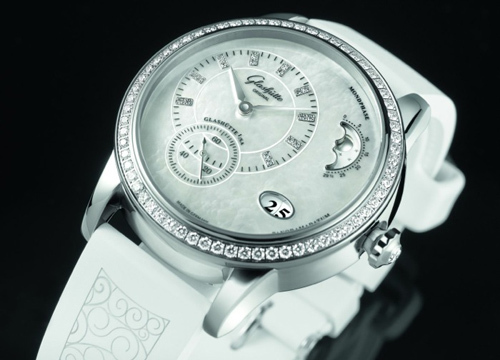 The Glashutte Original Senator Tourbillon luxury watch is a stylish classic, executed in white gold. The fascinating dial presents elegant Roman numerals and a classic railroad ring, which have been engraved in the surface of the dial and then silvered. The distinctive panorama date display is positioned at 12 o’clock and presents white numerals on a dark ground. The exceptional, eye-catching flying tourbillon with seconds display is positioned at 6 o’clock, thus forming a harmonious optical counterpoint to the panorama date. If you interested in buying a luxury Glashütte Original watch, please contact The Life of Luxury and we can help you choose the right watch at the best price – either for you or that special someone in your life.